Ready to Achieve IT Excellence? Consultis Has You Covered. relationships with our clients and our talent so that everyone finds the perfect fit. 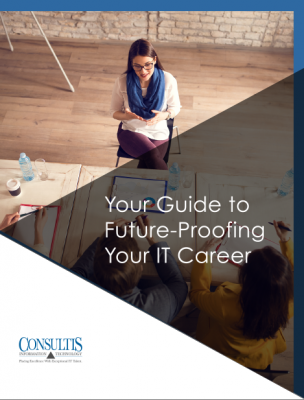 Will your IT career evolve with an ever-changing economy? The future is hard to predict, but if you prepare for a wide range of future events, your career will thrive in most circumstances. And we’d like to help! Our FREE eBook explores the circumstances, challenges, and opportunities that can influence the job market. My experience with Consultis has been nothing but extraordinary. They helped me locate a new job after my old company laid off our entire IT staff. They answered any questions I had and made the process of finding a new job super easy. They placed me in a perfect job that I would have struggled to find myself. They spent time answering questions & making you feel like you are their only client. I would recommend Consultis to all my friends and also for companies. I have an international career, working in 8 countries, and Consultis delivered world class service. They did a fast and deep assessment of both sides, the company and myself, and they got a perfect match for the position. The Consultis experience one of the best of my career. Every detail was fantastic! The Consultis team was very professional and they know how to get the job done. It was an amazing experience; the team is supportive and knowledgeable in the recruiting industry. I received quick responses and individual attention. I had the best experience I have ever had with an IT recruiting company. I felt almost embarrassed by how much attention the Consultis team gave me and how committed they were to placing me. It’s not the first time I’ve worked with a recruiter, but it’s both the most successful and the most enjoyable. I chose Consultis because of my long trusting relationship with Dana Ingram. She is a straight shooter and I can always count on her to deliver. I would recommend Consultis to others because Dana Ingram I’ve been doing business with Dana Ingram for close to a decade. She is someone I can trust and know her values propagate into her team. I’ve worked with Dana Ingram in the past, and she has an uncanny ability to match not just skills and talent, but character for candidates to what is an excellent fit for my teams. She makes it so easy to find the right candidates because she already understands what I’m looking for. It’s a pleasure working with Judi. Judi is extremely responsive, patient and always willing to go the extra mile to help us get the full picture on a potential candidate. She understands the importance of the complete fit, in addition to matching skillsets to the role. Consultis provided the best candidates for the role that we needed to fill. I have recommended Consultis to co-workers. They were very professional. The San Antonio team provided timely accurate information, allowing us to make our hiring decision with confidence. Compared to the other recruiters I work with, they knock it out of the park. We will continue to look to Consultis for our IT hiring needs. The San Antonio office is always fired-up and always finds me candidates when my corporate recruiters cannot. I will use Consultis again because the produce results. Outstanding experience! 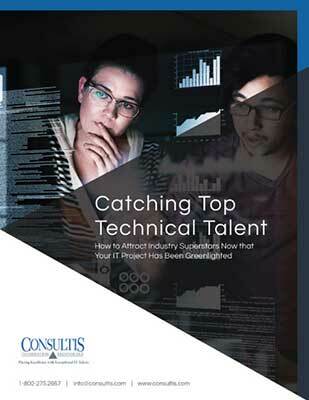 Consultis helped with the staffing of several technical positions. Their approach of quality over quantity, as well as the candor in discussing candidates was refreshing. The team also put a lot of extra effort into identifying exactly what candidate skills and attributes would be right for the positions, as well as updating their screening during the recruiting process. Consultis definitely has a focus on the right fit between candidates and the organization to foster a long term placement. I would recommend Consultis to anyone looking for staffing assistance in IT.